MUMBAI: A day after Prime Minister Narendra Modi added “chowkidar” to his Twitter handle profile and asked people to take the #MainBhiChowkidar pledge against corruption, Maharashtra chief minister Devendra Fadnavis Sunday followed suit. 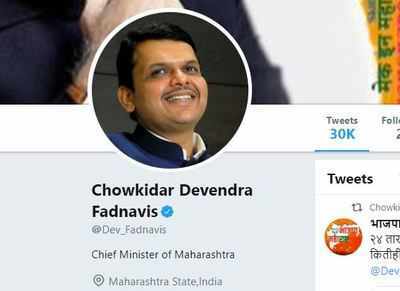 The profile name of his Twitter handle @Dev_Fadnavis was changed to “Chowkidar Devendra Fadnavis” on Sunday. “Chowkidar” is a term often used by PM Modi to describe his role at the Centre as a watchdog against corruption as well as his hands-on style of work. However, the Congress, which has alleged corruption to the tune of several thousand crore in the Rafale fighter jet purchase deal, has been hitting back with the slogan “chowkidar chor hai” (watchman is a thief). The ruling BJP has now turned the watchman moniker into Lok Sabha poll campaign ammunition by asking people to use it along with their names on social media platforms. Several Union ministers and BJP leaders have already made the “chowkidar” addition to their social media profiles.